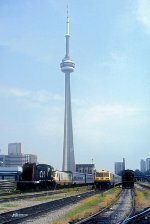 Description: Canadian National Railway S13 8513 at Toronto, Ontario, Canada on August 8, 1984, Kodachrome by Chuck Zeiler. Description: VIA LRC 6925 and CN S13 8513 at Toronto, Ontario, Canada on August 8, 1984, Kodachrome by Chuck Zeiler. Description: Canadian National Railway S13 8514 at Toronto, Ontario, Canada on August 8, 1984, Kodachrome by Chuck Zeiler.